Madeline DeFrees was born in Ontario, Oregon, November 18, 1919, and moved to Hillsboro at the age of four. She attended high school at St. Mary’s Academy, Portland, where she first met the Sisters of the Holy Names of Jesus and Mary, a congregation she joined after graduating in 1936. She was known in the order as Sister Mary Gilbert. DeFrees’s teaching career includes four years with the fifth and sixth grades; six years teaching high school; and the remainder in higher education. Upon receiving a B.A. 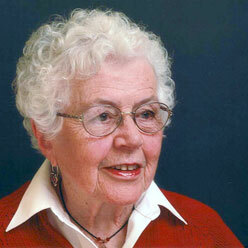 in English literature from Marylhurst College in 1948, DeFrees attended the University of Oregon where she earned an M.A. in journalism in 1951. DeFrees taught at Holy Names College, Spokane, from 1950 to 1967; at the University of Montana, Missoula, 1967-1979; and at the University of Massachusetts, 1979-1985. She was dispensed from her religious vows in 1973. Since her retirement to Seattle, Defrees has held residencies at Bucknell University, Eastern Washington University, and Wichita State University. She also taught in the Pacific University low-residency MFA Program. DeFrees’s eighth full-length poetry collection, Spectral Waves, came out in June, 2007, from Copper Canyon Press. Her book, Blue Dusk, New & Selected Poems 1964-2001 (Copper Canyon Press, 2001) won a Washington State Book Award and the Academy of American Poets Lenore Marshall Prize. Other honors include a Guggenheim Fellowship, a National Endowment of the Arts Award, and the Denise Levertov Award. DeFrees has published short stories, essays, journalism feature stories, and two poetry chapbooks, as well as two memoirs of her nearly thirty-eight years as a nun. She lives and writes in Seattle. The seven poems that make up this chapbook describes the nearly thirty-year exploration of the poet’s real and imagined ancestry; foreword by Gary Thompson. This collection is the poet’s first book since her highly acclaimed When Sky Lets Go. Her narrative skills continue to delight with an energetic intelligence and depth of feeling as well as startling wisdom in her allegorical style.